Although Mercury is the smallest planet in our solar system it is also the closest to the Sun and available for interested nighttime sky gazers. That’s right Southern hemisphere’ians (or is that hemisphere’ers?) Mercury will be visible just for you all September long so take advantage of the cooler nights to catch a glimpse of this moonless planet. Mercury has passed out of the morning sky and is now ready for viewing in the evening. The first two weeks of September, Mercury will be visible two hours after sunset with its apparition continuing on til the end of September. To view Mercury locate Spica (the brightest star in Virgo) – it is slightly below and a bit brighter than Spica -and will show up in the same binocular field for several days this month. However, for those of us in the Northern hemisphere? Sorry, Mercury will be outshone by the glare of the evening dusk. 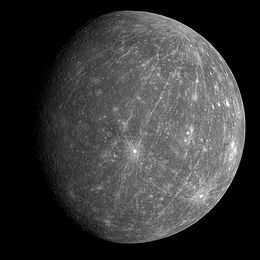 For starters Mercury is the second heaviest planet (Earth is first) in our Solar System because of its proximity to the Sun and also because of the effects of the formation of the Sun. When the Sun formed it is believed to have pushed all the dust and lighter gases away from the inner part of our Solar System. This left behind only the heavier elements such as iron. In fact, Mercury is made up of about 75 percent iron with a thin mantle – this “crust” is mostly silicate and is only about 500 to 600 kilometers deep (300 to 400 miles). We may think wrinkles and scars are something a promotional ad promises to remove with ease and precision, but for the surface of this planet these words are more than accurate. Scientists believe when the iron core of Mercury cooled, it shrank leaving behind wrinkles – these are called “Lobate Scarps” to be technically sound – which can be hundreds of miles long and up to a mile high! In addition, researchers have recently found evidence of hot molten at Mercury’s core which would further support their theory that this planet has more cooling to do. Mercury is also marked up by the millions of years of crashing encounters by comets and asteroids, but unlike other planets, this celestial body doesn’t have the ability to “heal” itself through natural erosion or other geological processes. This is largely due to its thick hard crust which will not allow any volcanic activity to take place. So basically Mercury will forever be marred. One of the extremes of Mercury is its lack of oxygen. This is once again due to its close location to the Sun and the size of this tiny wonder. Being a smaller-stature planet means that Mercury lacks the gravity it needs to hold onto an atmosphere, allowing any escaping gases to be sucked into space or blown away by solar winds. Another extreme Mercury experiences is its temperatures. Because of its lack of a stable atmosphere, nighttime temperatures can plummet to -300 degrees Fahrenheit (-184.4 degrees Celsius) and reach a whopping sun-facing high of +800 degrees Fahrenheit (+426.6 degrees Celsius). Have you ever had a day that felt like it would never end? Well on Mercury one day lasts 58.5 Earth days or about 1,404 hours. However, since it is so close to the Sun it makes a complete orbit around our burning ball every 88 days. Now that you’ve learned some fascinating factoids about our Mercury, be sure to check it out in the night sky. It will be well worth your time and makes a great family or date night activity.